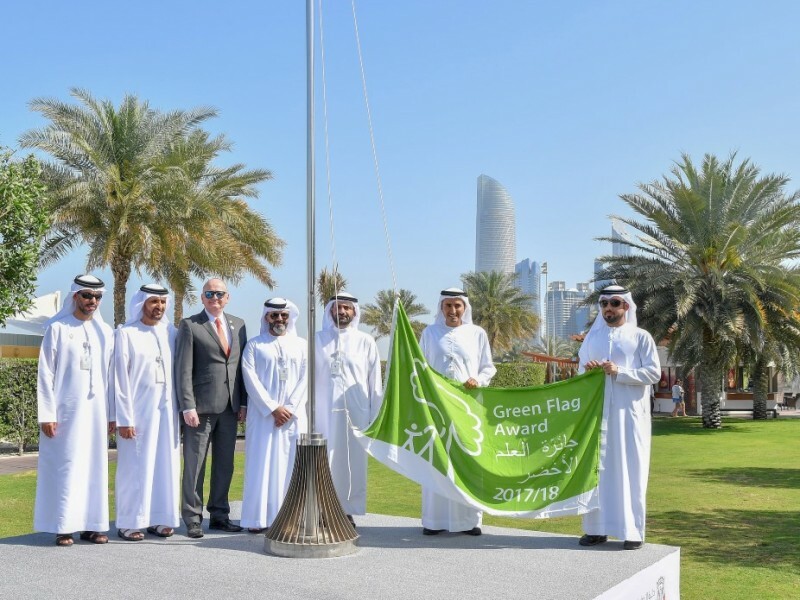 ABU DHABI, 10th March, 2018 (WAM) -- The Abu Dhabi City Municipality, ADM, has raised the Green Flag in a festive celebration at the Corniche Beach Park in Abu Dhabi after it received the internationally recognised benchmark from the International Committee of the programme. The UK Green Flag scheme recognises and rewards well managed parks and green spaces, setting the benchmark standard for the management of recreational outdoor spaces. The event was attended by representatives of the International Committee, IC, responsible for assessing Abu Dhabi Parks. Moreover, the IC has issued a decision to renew the Green Flag status awarded in 2015 to Dalma Park, Umm Al Emarat Park, Khalifa Park and Al Rahba Park. As such, the ADM has achieved a fresh privilege of hoisting the Green Flag at the Corniche Beach Park. "I am proud of the Municipality’s achievements made by Abu Dhabi emirate at all levels and hoisting the Green Flag in several parks across Abu Dhabi. It is a clear testament to the sound planning and unlimited support of our leadership to provide the finest recreational and service facilities, and support parks and recreational facilities to bring them at par with the international standards," said Saif Badr Al Qubaisi, General Manager of the ADM.
"The Abu Dhabi City Municipality is proud to be among the leading municipalities in Asia and Africa by obtaining the Green Flag symbol, which is tantamount to an international recognition that Abu Dhabi is implementing the standards provided for in the Code of the Award. "The Green Flag is an international award that targets directing and encouraging park management processes to bring them in line with the applicable standards that take into account providing high-quality services to community members. It is also an indicator of alignment with the efforts of protecting and managing the green environment," added Al Qubaisi. Eight primary standards should be met for accreditation with the green flag award. They are: providing a welcoming place for visitors, creating a health and safety facility fitted with safety requirements, providing hygiene and maintenance of facilities, complying with sustainability standards, preserving the nature and the heritage, social interaction, marketing and management. The awarding of the Green Flag is of great importance, especially in identifying the best practices that should be achieved in the management of parks and the green areas. The nominated parks, which have been selected following a review of their status and conformity with the Green Flag standards, will qualify for the international accreditation. Hence, a plan has been prepared to fulfil the remaining standards for all Abu Dhabi parks. Also, a three-year administrative plan was charted out for each park, detailing the works required to be carried out each year. It was highlighted that the parks, which had received the award must be viewed as a benchmark for other parks.